A Robot With a Delicate Touch « Adafruit Industries – Makers, hackers, artists, designers and engineers! 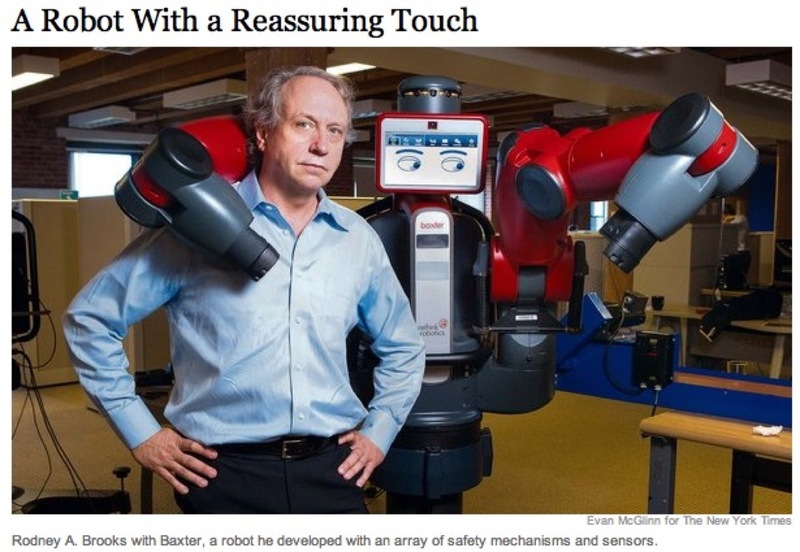 A Robot With a Delicate Touch @ NYTimes.com. Baxter, our flagship product, is America’s first adaptive manufacturing robot. Designed to use common sense and work safely alongside people, it’ll take your productivity to new heights—and deliver a true competitive edge. Rethink Robotics was founded in 2008 by robotics pioneer Rodney Brooks. Rod was a co-founder of iRobot © (Nasdaq: IRBT) and held positions there including CTO, Chairman and board member from 1990 through 2011. Now, as Chairman and Chief Technology Officer of Rethink Robotics, Rod is devoted to his mission of creating smarter, more adaptable, low-cost robotic solutions that can help manufacturers to improve efficiency, increase productivity and reduce their need for offshoring. The real question is, can you upload his AI to the Lucky 38’s mainframe to allow you to take over New Vegas?